Female talent is a vital business resource, tackling barriers to equality can unlock new opportunities for growth. Join us for this HR roundtable and find out how making full use of women’s capabilities paves the way to optimising your organisation’s human capital potential. Organised in partnership with ASEAN CSR Network, the event features Senior Parliamentary Secretary for MOM & MOE, Ms Low Yen Ling, NTUC Women’s Committee Chairperson Sister Thana, as well as HR reps from Procter & Gamble and CapitaLand at the panel discussion. Please visit the website for the panelists’ profiles and programme info. 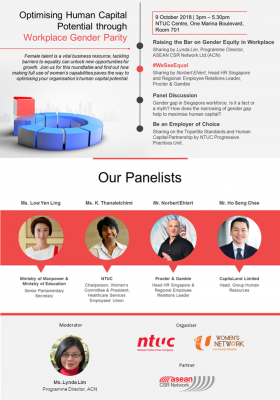 Due to limited capacity, priority will be given to Business Leaders and HR Professionals. All registrations will be reviewed for best suitability and successful applicants will be notified by email. Registration closes on 28 September 2018.